Drinkable water makes up only 2.5% of all the water on earth. And of that drinkable water, only 1% is readily accessible. 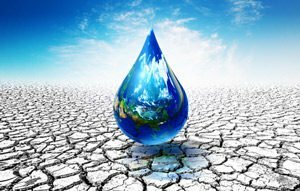 So it's not surprising that the world is in a water crisis. A full 4 billion people live in conditions of extreme water scarcity. That's more than half the world's population. But the pick we're bringing you today is helping to solve that problem. It allows communities to take the water that covers 70% of the earth's surface and make it both drinkable and affordable. The shortages faced by these areas are unsettling, and they can be frightening for those who live there. But one advantage the communities above have is that they are near the ocean. That means there's a solution. But that solution – desalination – requires a lot of energy (and therefore a lot of money). That's why it hasn't always been a viable option, especially in communities that aren't wealthy. Our pick today has been a major force in reducing the energy needs for desalination. It recaptures energy that would normally be wasted in the process and recycles it back into the system. The company's flagship product can reduce desalination-plant costs by 60%, for a total savings in plants around the world of $1.4 billion every year. For water-starved communities on the coast, a previously unworkable solution suddenly becomes a no-brainer. For this company's growth prospects, the math is pretty simple. The world's population is growing, and the freshwater supply is not. So desalination becomes more and more indispensable with time. 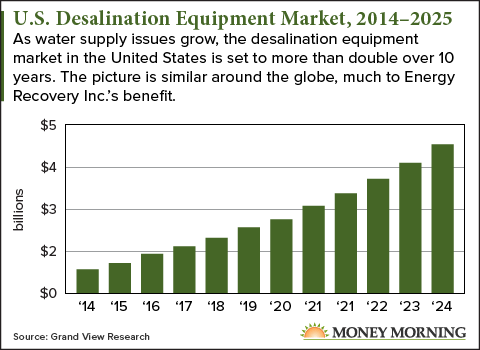 According to Grand View Research, the global water desalination equipment market is set to grow from $11.6 billion in 2016 to $23.3 billion by 2025. Between the unstoppable rise of desalination and the 90% market share of this company's products, our pick today is a must-have in your portfolio. What is the best way to get started from scratch or no brokerage account setup, to make the most amount of money with the least costs to invest? I'm anxious to learn more and get started. Check this company for growth and investment opportunities!